We are working hard to get ready for our exhibition at the world’s greatest flower show hosted by the RHS at London’s Royal Hospital in Chelsea. Hype for this year’s show has increased in recent weeks, with tickets now on sale and many of the garden designs revealed at a press conference in London. From the 24th – 28th of May, Blue Forest will be exhibiting in the Fresh outdoor area which is known for particularly creative and unique exhibit designs, so the pressure is on to create a pretty impressive treehouse concept! This year’s show is set to be the most impressive one yet, with Belmond and Bowden’s plans to create the largest display ever seen since the show began 102 years ago, The Dorchester’s very first bespoke pop-up restaurant serving afternoon tea and Phillip Johnson’s remembrance display of 300,000 handmade crotchet poppies adorning the show’s entrance. Chelsea will also include some photo exhibitions and a floral arch to celebrate HM the Queen’s 90th birthday this year. 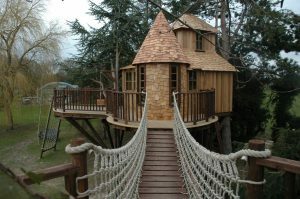 The Blue Forest team will be on hand throughout the show to answer questions and discuss treehouse ideas with visitors. Tickets are available to purchase here on the show’s website and RHS members can enjoy exclusive access to shows and ticket discounts. We will be posting further details of our designs on our website so watch this space.